I enjoy reading Pasadena PIO's mystery history series. Her most recent post told the story of how the railroad came to Pasadena. Prominent in that story is a man named James F. Crank. He spearheaded efforts to bring a railroad to town, donated land for the Raymond Hotel and, one way or another, figured in much of Pasadena's early development. “The first real hotel in the area was Sierra Madre Villa which began as a large house. The land was purchased by William Porter Rhoades and his father-­in-law, artist William F. Cogswell, in 1874. They built a comfortable house, planted the grounds in orchards and vineyards, and landscaped with rose gardens and ornamental trees. The house remained a private home until 1877, when the James F. Crank family arrived from Denver, seeking a healthful climate for the ailing Mrs. Crank. The Cranks stayed with the Rhoades, and during this time, a 20-room addition with a long glass-enclosed veranda transformed the ranch house into a full-fledged hotel. The hotel soon became an important social center, attracting guests from around the world. Famous for its hospitality, beautiful site, and eminent clientele.... Guests came for a week, for a month; or for the whole season, and their ranks included such names as Ulysses S. Grant, Collis P. Huntington, the Crocker and Mark Hopkins families from San Francisco, and tobacco millionaire Abbott Kinney." Below is a scan of a magic lantern slide made in 1890 by photographer Frederick Hamer Maude. 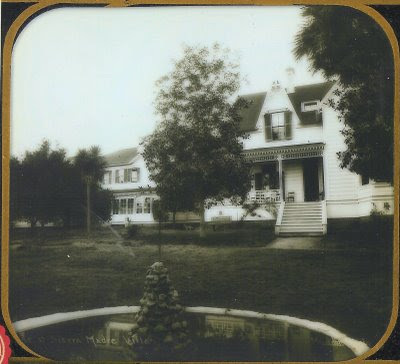 The photo is of the front of the Rhoades house which was expanded to accommodate the Crank family. While staying at this house, Mrs. Crank's condition improved and Mr. Crank became smitten with the area. They purchased the Fair Oaks Ranch, which was across the wash from Sierra Madre Villa and north of present day East Washington Blvd. The Crank House still stands on Crary Street in Altadena and is on the National Register of Historic Places. As for this old Victorian --- it was disassembled in the 40's and purchased by a nearby studio named the Walt Disney Company. Trim from the house was used in a movie and later on a building along Disneyland's Main Street. Here's that story. This is just great! Thanks for taking it the extra step. I assume from the name that the hotel was on Sierra Madre Villa. But where exactly do you know? Hi Simon, thanks for the comment. Present day Sierra Madre Villa Avenue was originally the road to the hotel. 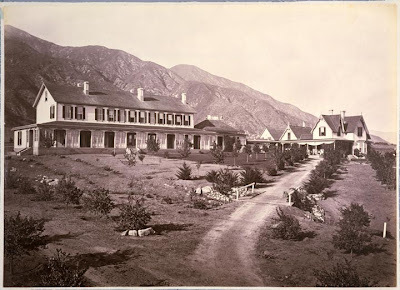 The hotel itself was located on the mesa above where the Eaton Canyon Golf Course is now, east of Sierra Madre Villa Ave. and south of present day Fairpoint. A small reservoir built to serve the hotel is still in place off of Fairpoint. Michael, what is the huge estate that is high up on Sierra Madre Villa, the east side of the street? Is an estate, or a private foundation of some sort? Hi Karin: Thanks for the comment. I'm pretty sure I know the property you're thinking of and it is a family estate -- not a foundation or commercial enterprise. Today I finally got around to pointing people from my blog to this post. Thanks again!